Welcome: Established in 1996, Creative Home™ has been a leading resource for quality household products, catering to retailers across the country and around the world. Our goal has always been to provide the latest in design, quality, & value. With offices in New Jersey, Taiwan, & China, our sourcing capabilities are well established and that has allowed us to become a major resource for marble kitchenware and bath accessories, teakettles, and pantryware. We've built our reputation based on the idea that you can offer quality and value, a theme that runs throughout the company. Company Profile: At Creative Home™ we love what we do and that's reflected in our product lines. 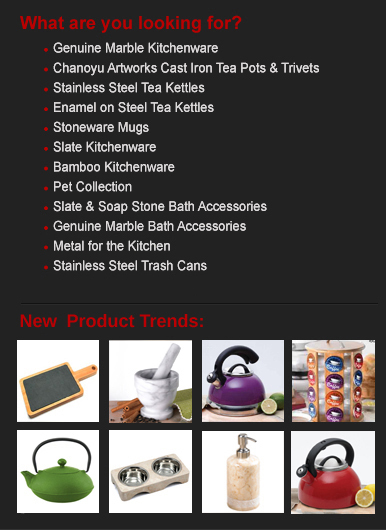 Whether it's marble home products, tea kettles, bamboo, or metal pantryware, we focus on the latest market trends. We then take those ideas and add our own touch by creating new and exciting designs that incorporate a wide variety of colors and materials. Our worldwide sourcing allows us to bring the finished product to the customer assuring a seamless process and uniformed quality as the end result. It's that attention to detail and great value which retailers and consumers have come to expect from us and that's what we provide. Please view our product lines and contact us with any questions that you may have, we're here to help.